Some things just go together – like summer and Berry Shortcake. A few days ago I would have written “like summer and Strawberry Shortcake,” but I’ve discovered a wonderful hundred-year-old recipe for Blackberry Shortcake, so I needed to broaden my analogy. 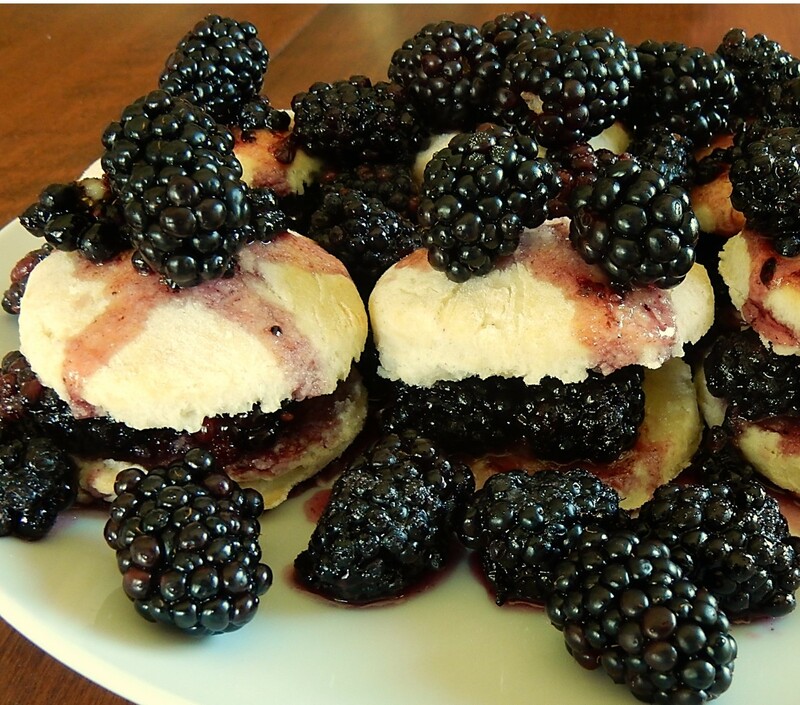 Slightly crushed, sweetened, juicy blackberries go between and above tender layers of shortcake biscuits. This delightful old-fashioned dessert, with the “new” twist of blackberries is perfect for a hot summer day. I did not use any whipped cream when I made this dessert since the old recipe did not call for it, and it definitely is not needed. The sweetened juice from the blackberries soaks into the biscuits and creates a delightful flavor and texture; though, if desired, the Blackberry Shortcake could be topped with whipped cream. If seemed unusual the old recipe called for buttering the split shortcake biscuits before putting the blackberries between the layers, but I gave it a try with several biscuits. The warm biscuits melted the butter, and it really was not very noticeable after the berries were added. I also tried serving this dessert without buttering the biscuits first, and there was very little difference in the taste or appearance. Preheat oven to 425 degrees. In a mixing bowl, stir the flour, salt and baking powder together. Cut the shortening into the flour mixture. Add 3/4 cup milk and stir just enough to combine using a fork to form a soft dough. If the dough is dry, add additional milk and stir a little more to create a soft dough. On a pastry cloth or other prepared surface, roll shortcake dough to 3/4 inch thickness. Cut into rounds 2 1/2 – 3 inches in diameter. (I turned a water glass upside down and used it as the cutter). Put on a lightly greased baking sheet. Cook about 15-20 minutes or until the biscuits are lightly browned. Remove from oven and split the biscuits in half. (I used a bread knife to cut them.) If desired, spread the biscuits with butter. Put the berries between and above the biscuits and serve at once. I used less sugar than called for in the original recipe because 1 1/2 – 2 cups sugar seemed like an excessive amount to put on the blackberries. Posted on July 15, 2018 July 14, 2018 by SherylPosted in FoodTagged blackberry, dessert, recipe. This looks like a delicious alternative to strawberry shortcake. I also wouldn’t mind just trying the shortcake on its own with butter. Just the shortcake and butter won’t be at all sweet since the recipe didn’t call for putting any sugar into the biscuits, but it probably would be tasty. This surely does look like my grandmother’s recipe, except she used all-purpose flour, and added some sugar to the dough. Sometimes, she would pat the dough into one large round, and then cut the shortcake into pie-shaped wedges. I’m going to try this as you’ve printed it, though. I’ve been putting up peaches like mad, and have enough left to do some shortcakes. The advantage of individual shortcakes, of course, is that I can share some with a neighbor, and make a nice presentation of it. I like the idea of sharing with a neighbor. I should do that more often than what I do. I think that all-purpose flour would work just fine. I sometimes struggle with whether there is a need to use pastry flour when old recipes call for it. I am finding it more and more difficult to find pastry flour at supermarkets around here. My daughter looked online, and found that a 1:1 mixture of all-purpose and cake flour was the equivalent of pastry flour, so that is what I used when I made this recipe – but a piece of me wonders whether using all-purpose flour would have worked just as well. Well, I tell you what. I’ll use all-pupose, and report back. 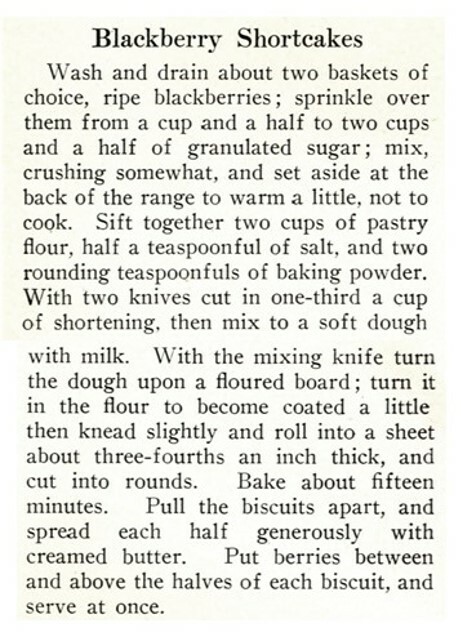 There’s a sweet shortcake recipe in one of my 1950s cookbooks that I’ve always used, and the only difference between it and the other shortcake/biscuit recipe is the addition of some sugar — a couple of tablespoons, as I recall. I’ll check it out. It would be great if you reported back on how this works. Like you, I generally use a shortcake recipe that calls for a little sugar – though I liked this recipe. The sweetened juice from the berries was enough to make the biscuits tasty. Oh yum. We can pick wild blackberries sometimes. I’ll hang on to this recipe. mmm. . . I wish that we had wild blackberries around here. I have warm memories of picking wonderful wild blackberries on the farm when I was young. I’ll certainly try this when blackberries come into season here. You are easily a month ahead of us. They are just hard green berries at the moment, and I always look forward to tramping the hedgerows looking for them once they’re ripe. I actually used blackberries that I bought at the store to make this recipe – though you may live in a area where the season is even later than here. I struggle with knowing when to post various seasonal recipes since many of the readers of this blog live further south than me, and sometimes comment that the season for various fruits is already over when I post a recipe. The perils of seasonal cooking! As for pastry flour, some suggest adding 1-2 Tbs cornstarch to 1 cup of AP flour. I tried it once and it worked well. Thanks for the info. This is good to know. This looks wonderful! The difference in the butter is probably, yours was not homemade… homemade butter has the tendency to be stronger in taste ,unless the maker was very careful to keep cream cold and make the butter while cream was still sweet. Your probably right. Your comment makes me want to try my hand at making butter. Wow do these look delicious! 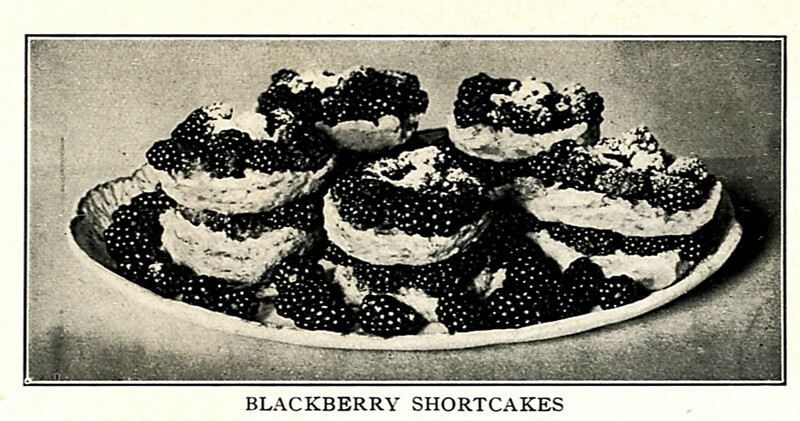 Your shortcakes were much prettier than the photo in the magazine. The recipe sounds delightful. Thank you! It’s nice to hear that you liked my photo. Looks delicious. I probably would choose not to butter the biscuits. Butter is definitely not needed. My blackberries are starting to ripen! I’m making this in the very near future! I’m sure I will! And I think even my dad, who is a die hard strawberry shortcake lover, will love it! Nothing better than berries and shortcake! Every year we eat strawberry shortcake for my mom’s birthday. We may have to rethink that. If your family likes blackberries I think that you’d enjoy this recipe. This could be my mother’s recipe! A definite yum. Makes me feel nostalgic. It’s nice to here that this post brought back some good memories. My husband became a need freak for blueberries.They are in the freezer, in bowls at the table,in his cereal. I tried to follow this recipe the best and it lent itself to Blueberries very well, actually lovely!!!! It’s wonderful to hear that this recipe lent itself well to blueberries. Blueberry shortcake sounds tasty. Oh my gosh, Sheryl … YUM!